Marriage come in various styles, usually depending on one's religious culture. It could also be based on one's social wing - conservative or liberal. The two distinct kinds of weddings are those of the Muslim marriage and the Christian marriage. They can be compared in the sense that they both have a strong impact on learning about culture and their differences are so visible. 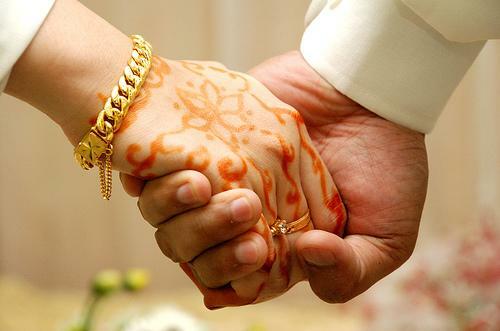 Of the two, the Muslim marriage is celebrated for a longer period while a Christian marriage takes place in a day. The Muslim marriage can take place anywhere and does not have to be in a mosque. The Christian marriage, on the other hand, has to take place in a church although sometimes some modern couples have a beach marriage. Christian marriages are officiated by a priest or a pastor while a Muslim marriage requires only any person who is knowledgeable about Qur'an and its Laws. In a Christian marriage, the pre-wedding requisite is a marriage proposal by the groom to the bride. A Moslem marriage, in conservative instances, there is a pre-arranged agreement between the parents of the bride and groom. However, there are many instances that a marriage is agreed upon by both marrying parties. A Muslim bride is adorned with expensive jewelry often in 22K gold bracelets, ear rings, and headdress for the wedding shawl. A Christian bride is not much into this, often wearing regular jewelry as enhancement. In the marriage rites, a Christian marriage is for a few hours, with the bride and groom seated together in front of a priest or pastor. Their marriage vows are solemnized with their replies of "I do " and with the signing of the marriage contract by both parties and their sponsors as witnesses. Even in the reception the bride and groom remain seated together. in the traditional Muslim wedding rite, the husband and wife are in separate rooms with the officiant individually asking them if they consent to the marriage and if they do it with their own free will. A "wali" speaks in behalf of the bride. The officiant's questions are answered three times with the word " qabul " which is Arabic for "I accept"; the marriage contract is also signed with two witnesses. Then the officiant takes them out of the rooms and pronounce them as husband and wife. They remain separated also in the reception. A Muslim wedding has a pre-wedding rite which involves visits to each of the bride and groom's family homes and their fathers are blessed. The most important rite is the "Nikah" which is the wedding proper. Then, the third rite is the "valima" which the groom hosts on the third day making the bride an accepted member of his family.